New Page Added: Where Are They Now? Just created a new page where you can see how the stocks I first mentioned as good long-term values are trading since then. You’d have to be living under a rock to not know about the amazing growth of warehouse club shopping. I mean everyone has heard of Costco, right? However, many investors may not have heard of PriceSmart, Inc. PriceSmart is to the Caribbean and Central America what Costco is to the United States: A great place for great deals on hundreds of everyday items. 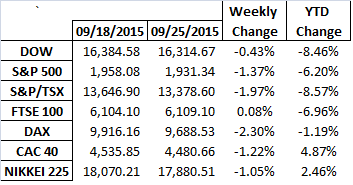 The S&P/TSX composite was the only index to escape last week’s market downturn with a solid gain of 1.38%. The Fed’s decision not to raise rates amplified concerns over the health of the world economy and we are likely to see stock weakness going forward…another opportunity to pick up solid companies for the long term investor. 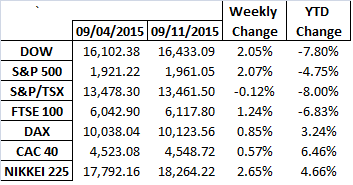 Canada’s S&P/TSX sat out last week’s market rally to post a small week-over-week decline of 12bps. Germany’s DAX, France’s CAC40, and Japan’s Nikkei 225 continue to be in the black with pretty decent YTD numbers.